After setting up my experiment via OpenSesame (great software!) I want to record my participants' reaction time to a specific target sketchpad. The structure of my trialsequence is shown in the screenshot. Will this set-up produce reliable collections of the reaction time to my target sketchpad (and only my target sketchpad)? I set the duration of the target sketchpad to 0, as advised in the tutorial for the gazecuing experiment. Also I run a "correction trial" after every false trial (see this thread: http://forum.cogsci.nl/index.php?p=/discussion/3635/one-correction-trial-after-false-reaction#latest). Can I set the duration of this sketchpad to 0 also and append a keyboard_response item behind it without screwing up my logfile or mixing up the recorded reaction times? The response_time variable is the last response time collected by any item. The response_time_keyboard_response is the last response time collected by the item called keyboard_response, etc. Does that make sense? Can I set the duration of this sketchpad to 0 also and append a keyboard_response item behind it without screwing up my logfile or mixing up the recorded reaction times? Yes, because the _[item name] disambiguates the different items. Thanks for your answer, Sebastiaan! 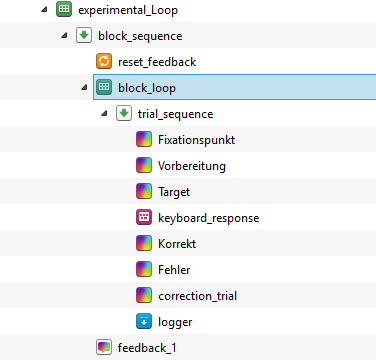 So in my case that means that the variable "response_time_keyboard_response" basically collects the same reaction time as the "response_time_Target"? Or, in other words, is the "response_time_keyboard_response" wrong, yet reliable so that I can still report it and use it for my analyses (I suppose that the variance of the values doesn't change from Target - response to keyboard - response...). By the way I programmed the experiment for some science course in University and it's rather about a proof - of - principle than real hypothesis testing, so that wouldn't be a problem. To chime in a little, the easiest way to find out, is to compare the values of the two variables for the experiment for which both are present. If they are the same, you're good, I guess.